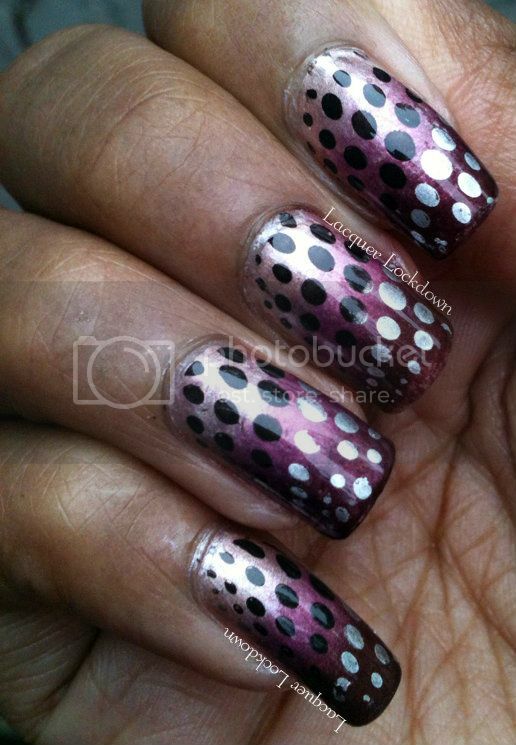 Lacquer Lockdown: Gradients and Dots - On Sundays I Stamp! For this challenge I really wanted to veer away from colors that are typical fall - oranges, browns, golds, but I definitely wanted to incorporate neutrals. For me fall is all about doing lots of neutrals and using rich vampy colors to add interest to outfits usually in the vein of accessories such as the aforementioned pashminas though coats, handbags, and shoes feature heavily into the equation. I tried to stick with the same concept on my nails and I was pretty pleased with the results. The hardest part for me honestly was picking a polish. I have so many great fall shades in my collection especially of late it was difficult to make a decision. your base gradient colors look soooo pretty together! I like it! This is a pretty fall color! Thank you sweetling! I am very excited for fall! Wow, the gradient you did was awesome and the colors...I die..love it!